Response: Unlike other branches of modern medicine, psychiatry still solely replies on patient reports and physician observations for clinical decision-making. Without biologically-based tests, the diagnostic categories for mental health do not carve nature at its joint. This is evident in the high levels of co-morbidity across disorders and heterogeneity within disorders. Through this research, we studied a large sample of adolescents who completed MRI-based functional imaging, and used recently-developed machine learning techniques to uncover specific abnormalities that are highly predictive of a wide variety of psychiatric symptoms. Essentially, we tried to find brain patterns that were predictive of different types of psychiatric symptoms. We discovered four such brain-guided dimensions of psychopathology: mood, psychosis, fear, and disruptive behavior. While each of these dimensions exhibits a unique pattern of brain connectivity, a common feature of brain anomaly is shared across the dimensions. 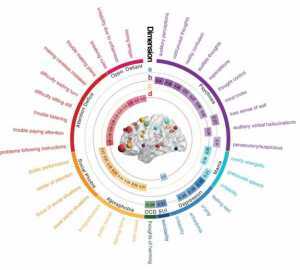 Notably, in all linked dimensions, the default mode network and fronto-parietal network, two brain regions that usually become increasingly distinct as the brain matures, were abnormally connected. This loss of normal brain network segregation supports the hypothesis that many psychiatric illnesses may be disorders of brain development. Response: This study shows that we can start to use the brain to guide our understanding of psychiatric disorders in a way that’s fundamentally different than grouping symptoms into clinical diagnostic categories. By moving away from clinical labels developed decades ago, we can begin to let the biology speak for itself. Our ultimate hope is that understanding the biology of mental illnesses will allow us to develop better treatments for our patients. Response: This study demonstrates the importance of incorporating vast amounts of biological data to study mental illness across clinical diagnostic boundaries. Moving forward, we hope to integrate genomic data in order to describe pathways from genes to brain to symptoms, which could ultimately be the basis for novel treatments for mental illness. Response: Future breakthroughs in brain science to understand mental illness requires large amount of data. While the current study takes advantage of one of the largest samples of youth, the size (n=999) remains dwarfed by the complexity of the brain. The neuroscience community is actively working towards collecting higher quality data in even larger samples, so we can validate and build upon the findings.